In The Explainer: The Syrian Crisis - Part I, published in this space on March 6, I focused on the presidency of Hafez al-Assad and the demographics of Syria. In this second and final part, I will focus on the presidency of Bashar al-Assad and the rebel movement that is raging across Syria against his dictatorship. 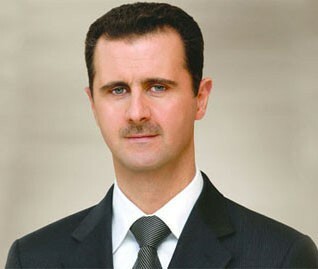 Bashar al-Assad, an Ophthalmologist, is the current president and youngest son of Hafez al-Assad. He was not the chosen heir to his father's presidency; it was his older brother, Bassel al-Assad, who was groomed to succeed Hafez. However, Bassel died in a car accident when he rammed his Mercedes at high speed into a roundabout. At the time of his father's death, Bashar was 34; however, the Syrian constitution stipulated that the president must be 40 years of age. To overcome this constitutional hurdle, the Syrian parliament amended the constitution within 48 hours of the death of Hafez al-Assad, to lower the minimum age for the president from 40 to 34. This way Bashar became the president of Syria. This can be looked at in another way: Bashar forced the parliament, populated by his father's lackeys, to change the eligibility for president's office by tweaking the constitution. You do not expect a person who becomes president through force and manipulation to respect the will of the people of his nation. All dictators are paranoid by nature. Bashar al-Assad is no exception. With the help of the secret police, he crushed all political opposition, denied basic freedoms to his people, while repression, nepotism and economic corruption became the order of the day. Thousands of opposition political activists were sent to jail without trial. In fact, Bashar would always romp home with more than 98 per cent of the vote, like in the 2007 presidential election. It is nobody’s guess that the elections were a one-sided affair, with all legitimate opposition leaders either disqualified or put in jail. In short, Bashar continued his father's policy of subverting the system to perpetuate his rule. While the political and military elite are enjoying the fruits of Bashar's dictatorship, life is nothing less than a living hell for the ordinary Syrian. About 50 per cent of the total population of 23 million is below 30 years of age, a feature that demographers call the 'youth bulge'. As the population expands while the economy stagnates because of official apathy, unemployment numbers are rising by the day. With an overall unemployment rate of over 20 per cent and youth unemployment rate at over 40 per cent, the Syrian youth are frustrated at lack of economic opportunity, social security, and employment. Today it is the youth who are taking to the street, calling for political and economic reform. To summarise, a high degree of youth unemployment, widespread corruption, lack of basic freedoms, discrimination against certain groups of people (like Sunnis) and the all-pervasive shadow of a totalitarian state have all come together to explode in the face of Bashar. Inspired by the success of the popular movements against dictators in Tunisia, Egypt, Libya, and Yemen, the marginalised and frustrated people of Syria took to the streets, first peacefully and later violently, demanding that Bashar al-Assad step down from the presidency. As Syrians came out in thousands to hold protests in major towns (like Damascus and Homs), Bashar’s response was on predictable lines: shoot at sight, arbitrary detention without trial, and charge the arrested protesters with draconian provisions like treason, all aimed at crushing any form of dissent against his regime. The situation in Syria is slowly veering toward civil war. Security forces, loyal to Bashar's regime, have killed more than 8000 protesters. However, even in the face of an unrelenting onslaught by troops loyal to Bashar, the rebels are not giving up. There has been growing condemnation from the international community against Bashar's atrocities against the rebels. Efforts by the Unites States, EU and Israel to impose punishing sanctions against Bashar's regime have been stymied by Russia and China. Recently, Saudi Arabia sent arms to the rebels to fight the regime in Damascus; the irony of the situation would not be missed on anyone who knows the autocratic and despotic royal house in Saudi Arabia. While Saudi Arabia muffles any voice that rises against the royal house, it is 'helping' the rebels in Syria. Because Saudi Arabia is Sunni, the Syrian rebels are Sunni, while Bashar al-Assad is an Alawi Shia. Now bring in the larger regional picture: Bashar is backed by Shia Iran, a sectarian and ideological rival of Saudi Arabia. In a simple sense, great power politics is underpinned by regional, ideological and sectarian power struggles. There is great anxiety in the United States, EU, Israel, Saudi Arabia, Iran, and Lebanon about the outcome of this massive rebel movement in Syria. Will Bashar al-Assad end up like Zine El Abidine Ben Ali of Tunisia, Hosni Mubarak of Egypt, Muammar Gaddafi of Libya, and Ali Abdullah Saleh of Yemen? If yes, what will be the impact of the outcome? strategic realignment, especially with regard to the role of the United States in the wider Arab World and Middle East. However, not withstanding these scenarios, Bashar al-Assad may yet survive to live another day, a day that may come to signify the triumph of sheer brute power over people power. Labels: Arab Revolutions, China, Democracy, Israel, Middle East, Religion, Terrorism, The Explainer, U.S. Wonderfully explained! this was a big help. A huge improvement over reading the wiki article for the syrian crisis. Thanks! Your articles as always make for wonderful reading. Could you please explain the reason for China's and Russia's support of the Syrian regime? because bashar(shias) is backed by iran,and iran,china is having problem with US(due to violations of nuclear deals). How easily can someone say "Radical Muslim Brotherhood", when they have no clue about the prevailing situation. If people are denied access to basic amenities, their children massacred, women raped what do you expect out of them? Peaceful protests on the streets? And the so called US government's plausible support, where is it? when you see chemical weapons used you do nothing, instead you wage wars on countries like Iraq for their assets and term it as "safeguarding people against the weapons of mass destruction". Pathetic world we live in! @Anonymous: The Russian support is there because Hafez al-Assad was on very good terms with Russia. Russia supplied him with Aircraft and Ammunition several times during the 3 decades he ruled. The same relation continued with his heir. Of course, there always is geopolitical strategy. Syria, I've learned has been a very important place, in terms of trade, since age old. The british, the french, and now the US, and Russia all have their eyes on Syria because it's loyalty (or forced cooperation) will be key in certain circumstances that are beyond the scope of this discussion. Thank you for the wonderful insight about Syrian crisis. It would be wonderful if you could also explain why would the oil prices spike in case Basheer goes. ?